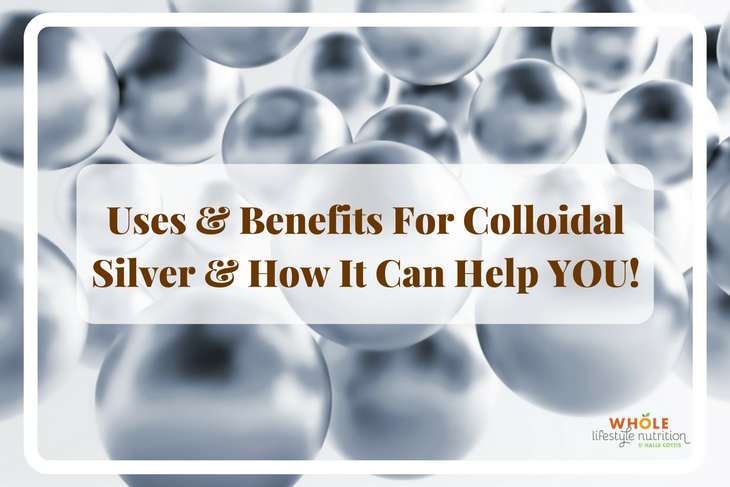 Uses and Benefits for Colloidal Silver and How It Can Help You! It has antibacterial, antiviral and anti-inflammatory properties, helps heal wounds and cuts, and helps treat eczema, rosacea, and psoriasis. Colloidal silver is used to treat infections due to yeast; bacteria (tuberculosis, Lyme disease, bubonic plague, pneumonia, leprosy, gonorrhea, syphilis, scarlet fever, stomach ulcers, cholera); parasites (ringworm, malaria); and viruses (HIV/AIDS, pneumonia, herpes, shingles, warts). Colloidal silver is also used for lung conditions including emphysema and bronchitis; skin conditions including rosacea, cradle cap (atopic dermatitis), eczema, impetigo, and psoriasis; and inflammation (sometimes due to infection) of the bladder (cystitis), prostate (prostatitis), colon (colitis), nose (rhinitis), stomach (gastritis), tonsils (tonsillitis), appendix (appendicitis), and sinuses (sinusitis). Other uses include treatment of cancer, diabetes, arthritis, lupus, chronic fatigue syndrome, leukemia, hay fever and other allergies, trench foot, and gum disease. Colloidal silver is also used to prevent flu, H1N1 (swine) flu, and the common cold. Some women take colloidal silver during pregnancy to aid the baby’s growth and health as well as the mother’s delivery and recovery. It should go without mentioning that you should always talk to your healthcare provider before trying this or any supplement. 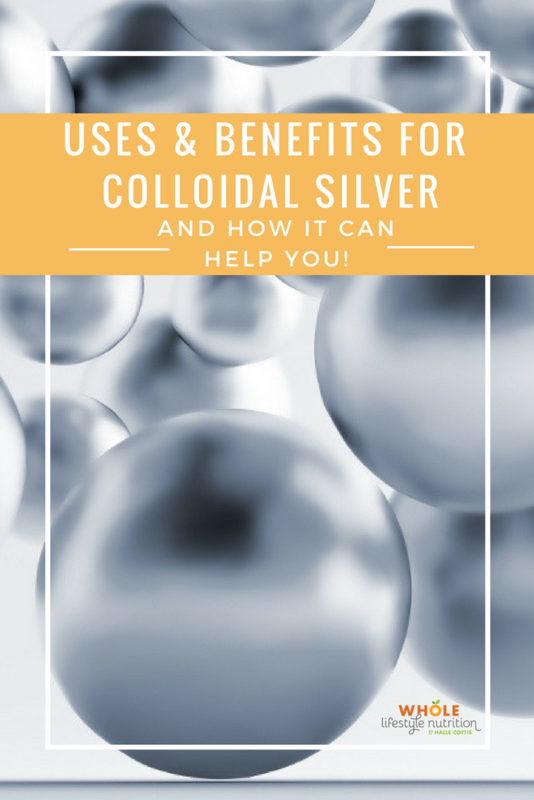 There are so many uses and benefits for colloidal silver, and better yet — there are also proven benefits too! Here are 8 proven colloidal silver benefits from our friends over at Dr. Axe. Where Do I Find Colloidal Silver? When looking for colloidal silver, it is important to get a good quality colloidal silver. This is the colloidal silver that I use and LOVE! If you are looking for additional research and reference points, here are 51 Amazing Colloidal Silver Benefits and the research that backs their claims. If you’d like to see how I use colloidal in my new book Natural Solutions for Cleaning & Wellness, you can take a look inside – 23 Natural Solutions That You Can Try Out TODAY! I hope you enjoyed this post and found value from it. If you’d like to share this post with like-minded people, please feel free to share. « What is Diatomaceous Earth and Why You Should NEVER Ingest It? Can’t wait to see and the product. No need to wait, any 10ppm colloidal silver works great. I like Advanced Silver Company best, but whichever you buy, make sure its 10ppm, because more is less. Not what you’d normally think. – 10 ppm colloidal silver is more effective than 20ppm, or higher. Why? 10ppm solutions have much smaller size particles, resulting in greater overall surface area, and greater individual numbers of silver particles. How? The formula for Parts Per Million is, 1 ppm = 1 milligram / 1 liter. So, 20ppm colloidal silver has 20mg of silver per liter of water (20 parts per million), and its particle sizes average approximately .01 microns. The 10ppm colloidal silver has only 10mg of silver per liter, but particle sizes are approximately .001 microns. The result: 10ppm colloidal silver has particle sizes 10 times smaller than 20ppm solutions. Amazingly, this also results in 5 times more individual silver particles than a 20ppm solution. And, it also means 10ppm has 5 times greater absorption and excretion in and out of body than 20ppm. * More info: S.E. Foran, Therapeutic Properties of Silver: A Historic and Technical Review, Quanta, January 2009. Sorry, but that’s just a lot of misinformation. Concentration or ppm has NOTHING TO DO with particle size. Particle size of nano silver should be in the 5-20nm range, NOT micron size. For different uses, different types of colloidal silver should be used: ionic silver for skin problems, (metallic uncapped) nano silver for stomach problems and gelatin capped nano silver for internal use, where you need the silver ions to reach the intestine or the blood stream. Recommended concentrations also vary greatly depending on use: 0,2mg/litre (0,2 ppm) for water purification, 5-15 ppm for skin application, and 2-5 ppm for internal use (considering we have about 6-7 litres of blood, some argue we should therefore ingest 1 litre of 12-35ppm over a short period of time). I’ve used it for about 25 years with excellent results! In the 90s, I was suffering form an unknown, undiagnosable problem that no one could give me an answer or a cure for. A friend suggested CS. It rang some old bells. I had read an article years ago about it, but had completely forgotten about it. I asked him to send me the two strips of .999 fine and directions. Long Story……… He did and I did and taking about 8oz a day for a month, I banished this whatever it was from my body! My Dr did a few blood tests but was never able to identify what it was. Since then, there hasn’t been a day when CS was not in my medicine cabinet. About one gallon. What is the safest kind of Silver immunity builder to take everyday? Internally ? Also what are the other kinds of silver used for? I have used it for years and years. It is natural and works like a charm. Built up my immune system so much so that I have not been sick for 40 years, just the occasional cold. I take one tabel-spoon once a day and never have a problem. I have recommended it to so many of my friends and they now love it. Goodday do you dilute it with water? How do I take it or use it properly? A friend sent me a 8oz bottle of silver crystalline nano 30ppm by Organa to swoosh in the mouth for toothache. But can drink it? If so, how much? I’m trying it for the 1st time today, I’m alitlle scared about my skin turning grayish. Since you have used it for do long, did you have a problem with it changing your skin tone ? Silver does not build up the immune system, it just kills funghi, bacteria and virus. It is not recommended to build up a constant presence of silver in the body, due to its toxicity and also because it will turn bacteria resistant over time (less so than with antibiotics, but still…). Only take silver when you have a specific problem! Which brand did you use that you got such good result? Do you dilute it with water when taken? Does silver water helps develop brain? Not sure why WEb MD would negate the tons of things most of us know about silver. Except there’s no money to be made so they don’t like it. I have seen it do miracles. We don’t make this stuff up. Lois, you hit the nail on the head! Big pharma can’t make money off it, so they will try to say it’s badm I love colloidal silver and seen it’s healing effects! They can say its bad all they want, yet push synthetic drugs all day long. Most of the natural remedies with great benefits are called dangerous by the pharmaceutical companies….until they find a way to market it for large profits. I don’t know if this will help with aching breasts, but iodine should. My father makes his own colloidal silver, I have used it many times to cure ailments. My wife most recently had shingles, which were cured in 10 days by drinking 2 oz. twice a day and applying topically to the sores on her skin. How do you make “home made” colloidal silver? I take a thyroid pill. Should I stop spraying the silver probiotics? i take a thyroid pill, is it safe to injest silver? Hello. Does the silver stay in the body or does the body get rid of it. If the body does get rid it, how? Sliver must be a heavy metal and the body does not get rid of heavy metals so easily. I’ve heard that sailors used silver coins in their barrels of water to keep sterile. I never heard they reused new silver coins to replace the “old” coins. Metallic Silver has a half life in the body of 7-8 days, so yes, the body will get rid of most of it. The problem is when you ingest ionic silver (Ag+) (instead of metallic nano silver AgNP), or a lot of nano silver, because the silver ions will react with body fluids to generate silver salts and chlorides that are not soluble and will remain in the body (organs and tissues). This is actually what calls the discoloraton of the skin and eyes, known as argyria. Moderate intake of nano silver (AgNP) has not reported any of these symptoms. reported using on their cats and dogs for different disease. Always check with your vet but it worked for me. I now take silver myself just to keep good health. I have been struggling with a intestinal infection from Mexico and then remaining heartburn for 3 weeks. 2 ER visits and about 10 prescriptions later, nothing was helping and they couldn’t give me any answers. With it being Christmas Eve I was desperate for relief and sent my hubby to GNC before they closed for the holiday. 3 doses of silver mixed with aloe juice and I feel better than I’ve felt in a month! I put it on my balls. It really helps. Please read the rest of the WebMD article that is quoted. Those may be “uses” of the silver, but if you read the article further it states that these uses are likely ineffective and even harmful.